Russian jets have performed 14 combats flights, conducting six pinpoint airstrikes against Islamic State targets in Syria on Friday, according to Russia’s Defense Ministry. “During the day, the Russian aviation group continued conducting pinpoint airstrikes against the infrastructure of the IS group in Syria,” Defense Ministry spokesman, Igor Konashenkov, said. “Su-34, Su-24-M and Su-25 planes performed 14 flights from Hmaimim air base, during which six airstrikes against IS targets were conducted,” he added. In the town of Maarrat Al-Nuuman in Idlib province, an Su-25 attack aircraft completely brought down a large terrorist workshop, which was producing bombs and improvised explosive devices. A nearby IS base, hosting weaponry and military vehicles was also targeted, with ten pieces of military hardware, including several APCs, was eliminated, the ministry said. В течение дня 2 октября российская авиационная группировка продолжила нанесение точечных авиационных ударов по объектам террористической группировки ИГИЛ на территории Сирии.С авиабазы «Хмеймим» совершено 14 вылетов самолетов Су-34, Су-24М и Су-25, в ходе которых было нанесено 6 ударов по объектам террористической группировки ИГИЛ.Штурмовиками Су-25 в районе МААРЕТ-ЭН-НУУМАН, провинция ИДЛИБ, полностью разрушен замаскированный под завод газовых баллонов крупный цех по производству фугасов и самодельных взрывных устройств.Также уничтожена располагавшаяся рядом база вооружений и военной техники террористов. В результате удара сгорело более десяти единиц техники, среди которых — боевые машины пехоты.В районе ЭЛЬ-ЛАТАМНА, провинция ХАМА, бомбардировщиками Су-34 с корректируемыми авиабомбами нанесен удар по заглубленному командному пункту боевиков. По данным объективного контроля, прямым попаданием авиабомбы пункт управления и его наземная инфраструктура полностью уничтожены.В этом же районе самолетами Су-25 нанесены удары по двум бункерам, в которых располагались пункты управления формированиями боевиков и склады террористов. В результате попадания на одном из объектов сдетонировали боеприпасы, полностью уничтожившие данный объект.В районе ХАН-ШЕЙХУН, провинция ИДЛИБ, точечными ударами бомбардировщиков Су-24М и штурмовиков Су-25 разрушен пункт управления вооруженных формирований ИГИЛ.Точность наведения на цели самолетов российской авиационной группировки в Сирии достигалась их применением в едином разведывательно-ударном комплексе.#Сирия #Syria #ISIS #ИГИЛ #ВКС #ВВС #AerospaceForces #AirForce #Хмеймим #Hmeymim #СводкаOn October 2, in the course of the day, the Russian air grouping continued making pinpoint strikes at the “Islamic State” international terrorist grouping. 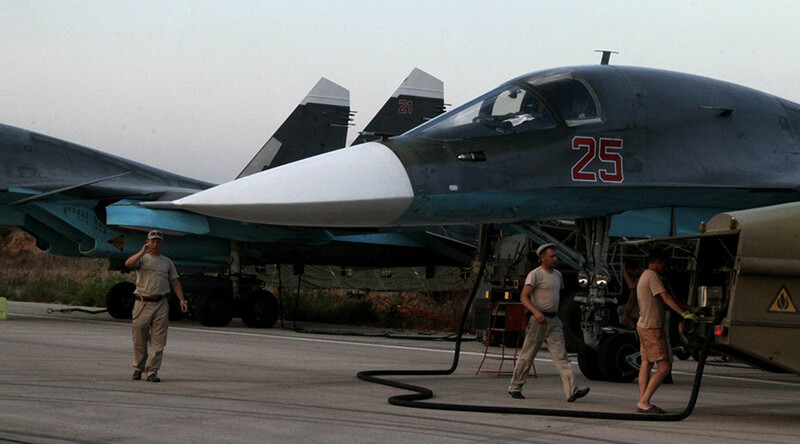 Su-34, Su-24M and Su-25 aircraft carried out 14 sorties from the Hmeymim air base attacking 6 ISIS objects.At Maarrat Al-Nuuman (Idlib), Su-25 attack aircraft completely destroyed a large workshop aimed for production of bombs and improvised explosive devices and disguised as a plant for gas cylinders.Terrorist base for armament and military equipment was also eliminated. As a result of an air strike, over ten pieces of military hardware including infantry fighting vehicles were burnt down.In Al-Latamna district (Hamah), Su-34 bombers equipped with guided air bombs blew up a militants’ underground HQ. The command centre and its ground facilities are destroyed according to the objective monitoring data. Moreover, Su-25 aircraft engaged two bunkers at the same district. There were situated command centres of militant units and depots of terrorists. Munitions of one of the depots detonated and caused their total destruction. At the Hann Sayhun district (Idlib), pinpoint strikes of Su-24M and Su-25 attack aircraft eliminated a command centre of the ISIS armed groupings.The targeting accuracy of the Russian air grouping in Syria was achieved by usage of aircraft within the reconnaissance-strike complex. A terrorist command center was destroyed by Su-24-M and Su-25 attack aircrafts near the town of Khan Shaykhun in Idlib province. In the Al-Latamna district of Hama Governorate, guided air bombs delivered from Su-34 bombers blew up a militant’s underground HQ, the Defense Ministry said. Su-25 aircraft also targeted two bunkers in the same area which had been hosting Islamic State command centers and arm depots. According to the ministry, munitions at one of the depots detonated and caused a total destruction of the bunkers. “The targeting accuracy of the Russian air grouping in Syria was achieved by the usage of aircraft within the reconnaissance-strike complex,” the Russian Defense Ministry said in a statement. On Thursday, the Defense Ministry had to address concerns sounded by the Western politicians and media that Russian bombardment actually targeted democratic Syrian opposition forces, instead of IS, and led to civilian casualties. The ministry stressed that it’s after IS in Syria, adding that all airstrikes are based on accurate intelligence data and take place away from residential areas. Russian aviation has been carrying out airstrikes against Islamic State and other terrorist groups in Syria since Wednesday. The operation performed at the request of Syrian President, Bashar Assad, is designed to provide air support to the government troops, which is struggling to contain the spread of jihadist militants in the war-torn country. As he was explaining Moscow’s decision to get involved in Syria, Vladimir Putin said that radicals from many countries, including Russia, have flocked to Iraq and Syria to join the terrorist group. They must be defeated so that they do not return home with battle experience and ideology adopted in the war zone, the Russian president stressed.